Hard to believe, but from about Crisis on Infinite Earths through Zero Hour, DC Comics had nearly no dedicated teen-character books on the stands. There were the rapidly-aging New Teen Titans, soon to become the New Titans, and Firestorm Ronnie Raymond (though that book's geopolitics skewed it older), but that was about it. It was not until about a year before Zero Hour that Robin Tim Drake's ongoing series arrived, followed in short order by Superboy and a variety of others long- and short-lived, including Impulse, Anima, Damage, and The Ray. What's de rigueur now with generally some combination of a Robin, Superboy, Supergirl, Blue Beetle, or Teen Titans title was once much more novel. Writer Scott Lobdell has been an easy whipping boy among the New 52 set, and admittedly his Doomed collection does contain the dialogue "OMG -- how adorbs are you?!" and "OMG doubled!" But if we forgive Lobdell his excesses, I'd venture he's kept "teen spirit" alive pretty well in the New 52, and his Superboy had a strong start even if the quality of Teen Titans rose and fell. Despite that Doomed only lasted six issues, it's got a breathless youthfulness that reminds me of the best of DC's post-Zero Hour teen era. We're pretty far from Tom Joyner's Damage's conspiracy mystery (plug for a Damage collection one day, and also of Joyner's Scarlett), but there's shades of Damage here, if not at least Keith Giffen and John Rogers's original Jaime Reyes Blue Beetle series. What might be most notable about Doomed now that Lobdell's Teen Titans run has ended is his single issue here teaming the "Doomed" Reiser with Wonder Girl Cassie Sandsmark. Lobdell's Wonder Girl has been one of the controversial things about his Titans run; I can't say yet if he mitigates that at all in the latter parts of that series, but his Wonder Girl issue here is clever and presents that character uncommonly well. There's no question Doomed is an odd book, made all the odder by the fact that Scott Lobdell only got six issues to tell his story and didn't undoubtedly tell all the story he wanted. To that end, though DC billed Doomed as a Superman: Doomed spin-off (though continuity ties, such as they are, are probably closer to Teen Titans), most of the evidence in the book points to protagonist Reiser not actually being infected by the Doomsday virus. 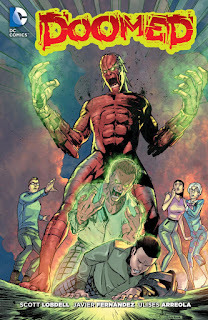 Instead, various scenes suggest Reiser's transformation to the Doomed monster might be either alien (but not Kryptonian) in origin or that his transformation might be magic-related, and this wealth of origin possibilities is part of what reminds of Damage. So abbreviated is Doomed, by the way, that Lobdell never even reveals Reiser's last name, though I wonder if there was more to it given Lobdell did have six issues in which to do so. That it was canceled so quickly is a testament to the fact that Doomed didn't make many waves, but among things to note (aside from Lobdell's resurrection of 1990s Superman character Alpha Centurion) is the aforementioned Wonder Girl appearance in Doomed's fourth chapter. The issue has a number of strikes against it, the first being that Cassie arrives on scene irrationally angry and holier-than-thou, precisely the personality traits lacking in her pre-Flashpoint iteration that made the New 52 version so controversial. Second, Lobdell manages to work in a reference to Wonder Girl's New 52 origin, one of the more cringe-worthy stories in Lobdell's Titans that involved Cassie's boyfriend, named Diesel (yes, Diesel). But the parallel Lobdell draws between Cassie's safeguarding of an evil armor and Reiser's sudden transformations into the Doomed monster is unexpected and smart. Equally that Lobdell has Wonder Girl let Reiser go instead of bringing him in to STAR Labs is a nice touch on the character's part that endears her in this volume. In just a few pages, Lobdell manages to take aspects of Wonder Girl's story that didn't work and turn them into interesting thematic ideas. Again, I'm not sure if Lobdell is doing the same over in his second run of Teen Titans, but Doomed is a success in the least because it gave me a new way to look at Lobdell's Wonder Girl elsewhere. In the midst of DC You, Lobdell also uses the newly-depowered Superman, who's been revealed as Clark Kent. I haven't read those issues themselves yet, but Superman here is charmingly unassuming. It turns out that he was actually one of Reiser's neighbors as Clark Kent, and so their interactions are more how one might talk to their neighbor than the Man of Steel, and it's fun to read. Lobdell's Superman is wonderfully wry in the face of danger, and certainly presents as more mature that Lobdell's Clark who quit in a huff from the Daily Planet. If this is reflective of Superman overall in the "Truth" storyline, that will be a Superman I'll enjoy reading. Artist Javier Fernandez is quite right for this series. His soft, rounder style reminds me of Stuart Immonen, who not coincidentally drew most of Alpha Centurion's 1990s adventures with Karl Kesel. Fernandez gives the characters very different body types, something a surprising number of artists struggle with, easily distinguishing Reiser from his friend Roman (secretly the Centurion), and them from Superman, etc. I'm very glad to see Fernandez continue with Lobdell into Red Hood/Arsenal and into the Superman titles and the Rebirth Nightwing; Teen Titans itself seems a good place for Fernandez, but I won't quibble with Nightwing either. As a side note in the Teen Titans Vol. 2: Rogue Targets storyline, I'd venture that's most of the reason anyone would pick up Scott Lobdell's Doomed; it's really not a Superman story, despite the billing. But as a story with little baggage in which Lobdell can pretty much do what he wants, it demonstrates Lobdell's deftness with a teen hero (even if Spider-Man analogues abound), and again artist Javier Fernandez shines. If you do pick it up, I don't think it will disappoint. Probably not great. I've got a soft spot for all that stuff too, so simply seeing Alpha Centurion on the page might color my perceptions a little. Email me if you want spoilers; Lobdell does some things with the character that I liked, but at the same time the Centurion spouts a lot of lofty "thee"s and "thou"s, kind of a dimwit, and over in the DC You Teen Titan books he comes off even worse. So again, probably not great, but who ever thought we'd see Alpha Centurion again?